The default password for all Linksys E900 routers is admin. This password is case sensitive, like with most passwords. Some routers don't require a username when logging on with the default credentials, but the Linksys E900 does - it's admin, the same as the password. The Linksys E900 default IP address is the same as most Linksys routers: 192.168.1.1. This device's model number is E900 but it is often marketed as the Linksys N300 router. There's only one hardware version of this router, so all E900 routers use the same information I just mentioned. Help! The E900 Default Password Doesn't Work! The username and password for your Linksys E900 router probably aren't the default information as you see it above. This is because you can (and should) change the default username/password after you first set up the router. If you don't change the default router credentials, anyone can use this information to get access to your router's administrative settings. However, changing the default information means it's much easier to forget what you've changed it to! Fortunately, you can restore the Linksys E900 router's default username and password by resetting the router to factory defaults. Resetting a router is not the same as restarting a router. To reset a router is to remove all the custom software settings (like the password) to return the router back to its factory default settings, whereas restarting a router just means to shut it down and then power it back up. Make sure that the E900 router is plugged in and powered on. Flip the router over on its top so that you have access to the bottom. With a paperclip or some other small, sharp object, press and hold down the Reset button (it's accessible through a tiny hole on the bottom of the router) for 5-10 seconds. During this time, the Ethernet ports on the back of the router should all flash simultaneously. Wait 30 seconds after resetting the Linksys E9000 router just to be sure that the software has had time to reset. Remove the power cable from the power port on the back of the router, and then wait 10-15 seconds before plugging it back in. Wait for another 30 seconds after plugging in the power cable to make sure the router has enough time to fully boot back up. Make sure the network cables are still attached to the back of the router, and then you can turn it back over to its regular position. Now that the Linksys E900 settings have been restored, you can use the http://192.168.1.1 default IP address and admin username and password to access the configuration settings. Don't forget to change the router's password now that it's using the default settings again. You can also edit the username if you want to amp up the security even more. I suggest saving this new information in a free password manager so you don't forget it again! Also remember that you have to configure the wireless network settings again (like the SSID and wireless password) now that you've reset the Linksys E900 router back to its default configuration, which cleared out all this information. See Page 61 of the Linksys E900 manual (linked at the bottom of this page) if you want to learn how to back up and restore your router's custom configurations. This is an easy way to restore your wireless network settings, DNS server settings, etc. in the event that you have to wipe them out again. Help! I Can't Access My E900 Router! You have to know the IP address of the router before you can login to it, but if you've ever changed that address to something else, then using the default http://192.168.1.1 address isn't going to work. Fortunately, you can easily find the Linksys E900 IP address without having to reset the entire router like is the case with a forgotten username and password. All you have to know is the default gateway of a computer that's connected to the router. See How to Find the Default Gateway IP Address if you're not sure how to do that. 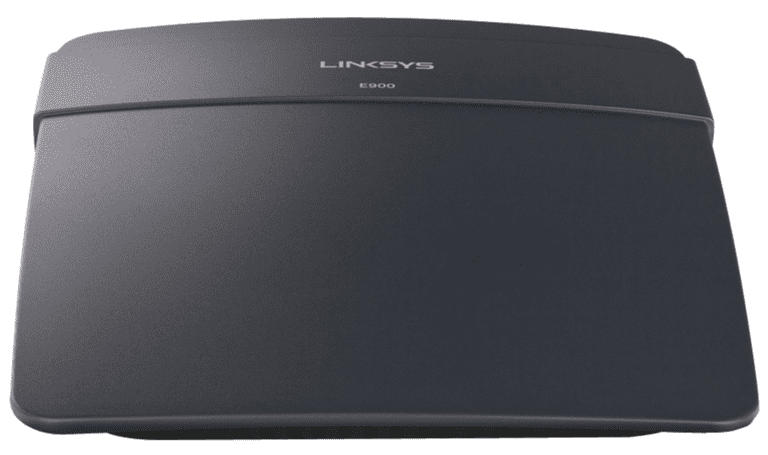 There's only one hardware version of the Linksys E900. On the Linksys website is the Linksys E900 manual, which gives you all the details about this router, including the information from above. The E900 manual is a PDF file, so you need a PDF reader to open it. The most up-to-date firmware version and Linksys Connect Setup software can be downloaded from the Linksys E900 Downloads page. Every other detail on this router can be found through the Linksys E900 N300 Wireless Router support page.